“The Epiphany” must be one of the strongest debuts of the year. 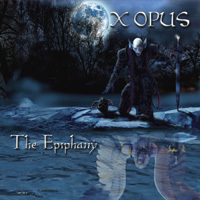 It has Symphony X written all over it but X Opus manage to etch their own strain of the genre. Two lead vocalists ply their wares in the album and it’s not clear from the promo forwarded by Magna Carta on who sings what. With that in mind, sometimes the vocals try too hard to be Russell Allen (Symphony X vox). When the music is more melodic and Firewind-like – as in ‘I’ll Find The Truth’ – the singing sounds more natural. Either way both singers are technically brilliant, there’s no doubt about that. Similarly impressive are the guitar solos throughout the album, with melodies that seem very much influenced by Yngwie Malmsteen as well Classical composers such as Bach and Mozart. The instrumental ‘Never Forgotten’ is one of the reasons to get hold of this album: melancholic acoustic guitar arpeggios, furious neo-classical solos and a fitting atmosphere provided by the keyboards all ensure a great listening experience. Clearly I did enjoy this album, but I also couldn’t get rid of a nagging feeling at the back of my mind that the songwriting misses something that would have enabled everything to gel together more strongly. And it’s not the most important thing, granted, but the artwork does look a bit cartoonish. At the end of the day, however, “The Epiphany” offers great music and showcases talented musicians. It’s a lively album from a band that is demanding attention.